Rising in the heart of Valencia's City of Arts and Sciences, the Barceló Valencia is a four-star hotel welcoming 187 spacious, bright, modern and unique rooms which come with cutting-edge facilities particularly suitable for business trips. After a long day of work, the fantastic 500 metre squared U-Wellness centre is open many hours a day and is located on the 10th floor. 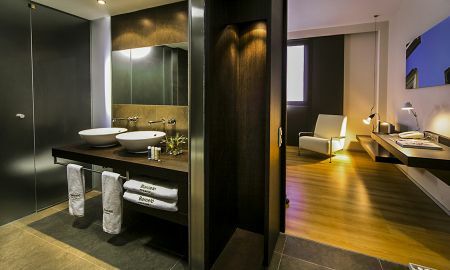 It proposes 2 treatment rooms and offers a stunning panorama over the City of Arts and Science. The spa also welcomes a gym and a complete water circuit to reinvigorate your energy and keep fit. The Barceló Valencia's hotel also comes with large and bright meeting & conference rooms where the latest technologies are available as a valid support to business events or seminars. 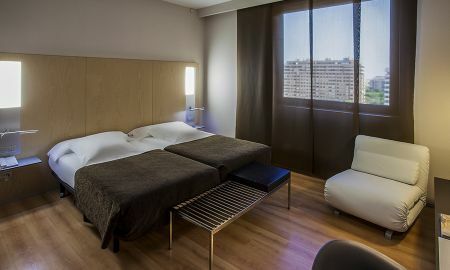 The Barceló Valencia is situated right on Avenida de France, opposite the Queen Sofia Palace of Arts, near the port, the Palau de la Música and in front of Valencia's City of Arts and Sciences. Malvarrosa beach is just 5 minutes from the hotel. The historic centre is within walking distance from the Barceló Valencia (10 minutes). The natural park of the Lagoon may be also reached very quickly. Valencia Trade Fair Centre, the Palace of Congress and the airport are just 20 minutes away. Please note that spa visits and treatments must be reserved in advance. The spa and the treatments both carry a surcharge. The spa is closed on Sundays and Mondays. Please note, the pool opens in summer from 13:00 to 20:00.